In July, fields are green, rivers still flow with clear, cool water, wildflowers bloom on hillsides and in ditches and the days are long and warm. Mountains, scenic Big Sky vistas, fly fishing and National Parks draw many visitors to our area this time of year. And while the tourists are usually surprised by our lack of humidity, cool evenings and late sunsets, these are just the items that make our area a grain farmer’s paradise, as well as a tourist hotspot. On the Johnson Ranch, in addition to beautiful views, July also brings the beginning of haying season and the culmination of irrigation. When many people think of Montana, they think of an iconic image of an anglers fly delicately tied to a line, dancing across cool rushing water. It’s perhaps this popularized, “A River Runs Through It” notion that confuses some outsiders into thinking our region has an abundance of water. While Montana is home to many iconic rivers and there are some times that water is bountiful, these times rarely last and the balance of use, appropriate allocation and preservation of our water is delicate. 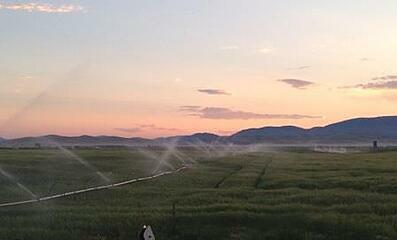 Irrigation is a necessity to grow most crops in Southwestern Montana and throughout the west. In some regions of the country and even Montana, grain farmers are able to use dryland farming methods – meaning they don’t need to irrigate for their fields to prosper. Our specific region is actually considered high desert and averages under a foot of precipitation annually so irrigation is necessary. 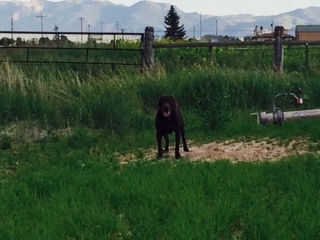 On the Johnson Ranch, we use three methods of irrigation. The first is a center pivot. If you’ve ever flown in an airplane and seen giant circles on the ground below, these were likely the work of center pivot irrigation. These mechanical pivots utilize overhead sprinklers and slowly rotate on a point around the field, gently sprinkling water from above. They are very low maintenance, perfect for larger fields and are a very efficient form of irrigation with little waste. 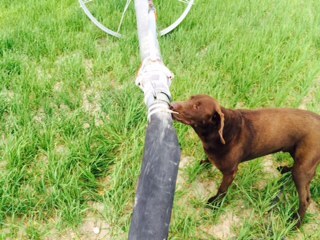 Wheel line and hand line are two other methods of irrigation we use on the ranch. Whereas the pivot essentially starts with the flip of a switch and with the right technology can be monitored from a farmer’s smartphone, wheel line and hand line are more labor intensive. A wheel line is a long tube of irrigation pipe linked together on large metal wheels that is propelled by a motor. Whereas center pivots work well on larger fields, wheel line is perfect for smaller or oddly-shaped fields. Hand line is similar to wheel line, but without a motor. The farmer must individually disassemble and re-assemble each piece of pipe when it is necessary to move the line and it is a very labor intensive process. 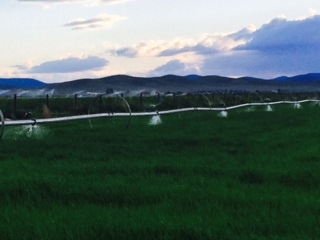 Some farmers use hand line to irrigate the pivot corners that are not reached by a center pivot. 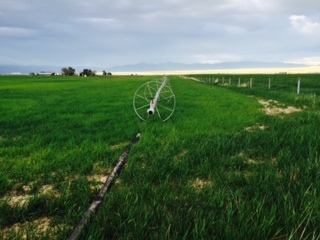 Both hand and wheel line use a “bird” for a sprinkler and can be slightly less efficient than center pivot irrigation. Water in the western United States is a precious commodity. It is a limited resource and prominent reminder that no matter how technologically sophisticated agriculture becomes, we are still dependent upon Mother Nature and the rain (and snow) she provides us. Our ranch receives most of its water from the East Bench Water District. This water district is a co-op of stakeholders working together to allocate the water from the Clark Canyon Reservoir, twenty miles to the south of our ranch. Clark Canyon is fed by runoff from the surrounding mountains and rain and snow throughout the year. The reservoir flows into the Beaverhead River and an intricate system of canals branch off of the river and feed water to different ranches across the county. The East Bench Water District and the Beaverhead Watershed Committee work jointly to uphold a system of checks and balances to ensure water is allocated responsibly, that our resources are not depleted and our watershed habitats are not destroyed. It’s a cumbersome task; the balance is often delicate, and appropriation systems are intricate and regional. In the end, how much water we have to allocate simply depends on the generosity of Mother Nature. Some years, water is scarce and fields receive one or two passes, or none at all. Other years, water is abundant and there are no restrictions on how long or how much you can irrigate. This year has been relatively average for Southwest Montana. It’s nearly the end of July and we are still irrigating, though the reservoir is lowering and with grain beginning to turn and hayfields flourishing, the end of our irrigation season is near. For many farmers, growing hay is a function of growing other crops. Hay is primarily used as an animal feed. 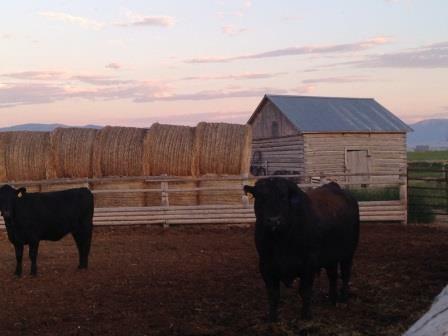 There are many varieties of hay ranging from wild grass, to mixed hay and grass blends to pure alfalfa. On the Johnson Ranch we primarily plant alfalfa. It is a perennial legume that normally lives four to eight years and has a deep root system, making it resilient to drought. After properly dried, alfalfa is a high protein feed for cattle, horses, sheep and more. Like other legumes, alfalfa is a nitrogen fixing plant. While other crops can use and deplete the soil of nitrogen as a necessary nutrient for their development, alfalfa actually puts this nitrogen back into this soil. That makes it an essential tool in crop rotation in climates where other legumes wouldn’t thrive. Planting grain in the same field year after year depletes the soil of nitrogen and ruins soil health. A rotation of alfalfa preserves soil health, can be used as a valuable feed and greatly improves agricultural efficiency. It’s a widespread crop because of its versatility and is a specialty in certain regions, such as Southwest Montana. Depending on climate, certain areas can actually harvest hay multiple times a year. In colder, higher altitude climates with wild grass hay, they may only get one harvest of hay. On our ranches, we get two healthy hay cuttings a year. We could cut three times, but after the third cutting the alfalfa would not grow back properly and would likely die over the winter. Certain hot, humid areas of the country can receive four or five cuttings of hay. After the windrows of hay cure, an implement called a rake is used to make an even larger windrow. A tractor then pulls a bailer over this row and creates bales of hay. Bales come in many shapes and sizes – large round, small square, large square, etc. Bale shape depends on the needs of the end user. Once the hay bales are created, the farmer must quickly get them off of his or her fields so irrigation can begin again and the next crop can begin growing. 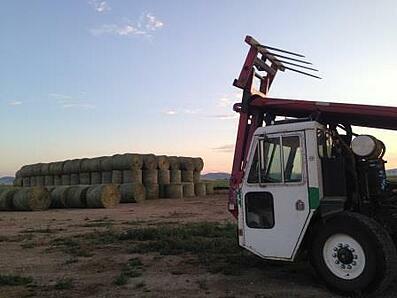 There are many ways of removing hay from the fields, but on our ranch, we use a Stacker Stinger to do so. In the winter, we use the hay from our fields to feed our cattle. Hay we do not use for our own cattle is sold on the market. Growing hay makes our ranch significantly more efficient and is a key piece in our efforts toward achieving a sustainable farming operation. 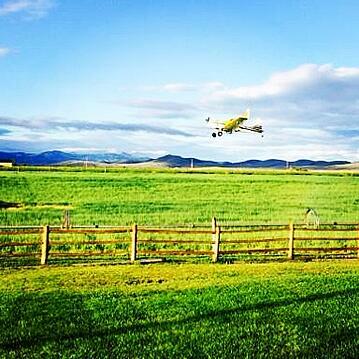 How Are the Crops Doing on the Johnson Ranch? So far, we’ve had a relatively good year for our crops on the Johnson Ranch. The early part of the growing season received significant moisture. Fields started off very green and lush and the growing season got off to a great start. Each year has its share of adversity, but so far we’ve been fortunate. The only major downfall we’ve had this season came in the form of a small bug called the cereal leaf beetle that decided to eat on the grain fields in our area. This small beetle eats the leaves of barley (and other crops) and leaves it more susceptible to external damage from wind and storms and also compromises its natural system of photosynthesis and generating food. As much as we work to avoid spraying pesticides on the field, this year it was necessary for the survival of our crop. The season isn’t over. As the grain turns, it becomes more susceptible to falling and other potential damage. Although we’re not “out of the woods” yet, we are thankful for the season we’ve had to date and looking forward to a GREAT harvest! We’ll see you at harvest time!